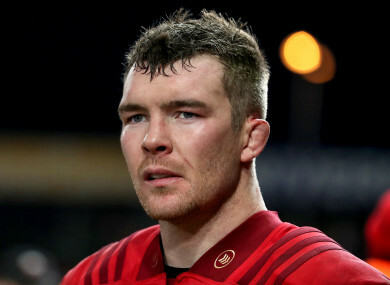 O'Mahony was bitterly disappointed with Munster's performance. IT’S PROBABLY STRETCHING it to say Munster received something of a reality check in the manner of their St Stephen’s Day defeat to Leinster, but what is for sure is that their provincial rivals have provided a considerable benchmark at this juncture of the season. Munster failed to turn up for the first 40 minutes on Tuesday and a deeply disappointing performance before the break allowed the visitors gain a stranglehold to eventually inflict a first defeat on Johann van Graan since his arrival last month. A first loss in six outings doesn’t immediately set the alarm bells ringing, particularly when you consider the back-to-back wins over Leicester Tigers, but both van Graan and Peter O’Mahony are in agreement that they have considerable work to do to catch the standard set by Leinster so far this season. “Yeah they are,” O’Mahony said, when asked if Leo Cullen’s side are now the team to beat. “I’m very impressed by them. They’re always a very good side and you know every year it’s difficult. You know it’s always a big game and they’ve proved over the last few weeks how good they are. “To come out this week and put a performance in like that in the first 40 (minutes) is impressive. Leinster have now won five of the last six meetings between the sides. A Munster man through and through, that hurts O’Mahony. “The supporters come out and spend a lot of money to see you play and we expect to win,” he added. Van Graan echoed his captain’s assessment of the status quo. “A year ago when I was in South Africa I watched them play games, week in and week out,” he said of Leinster. “Quality coaching, such big squad depth, 10 internationals in their forwards alone. A guy like Jordan Larmour the fullback, he really impressed me, he looks like he has been playing for years. “I’m very impressed by them. I think in this Pro14 they are definitely the side to beat. We said in the changing room we know now where we are, 10 points behind them in this one and we were seven short in the previous game [23-17 defeat at the Aviva Stadium in October]. Email “O'Mahony: Leinster are now the team to beat ”. Feedback on “O'Mahony: Leinster are now the team to beat ”.